BOGO Book Fair Basket Winner! 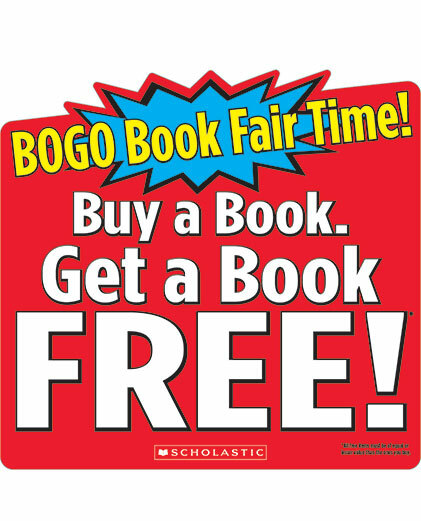 Thank you to everyone who volunteered and supported our BOGO Book Fair. 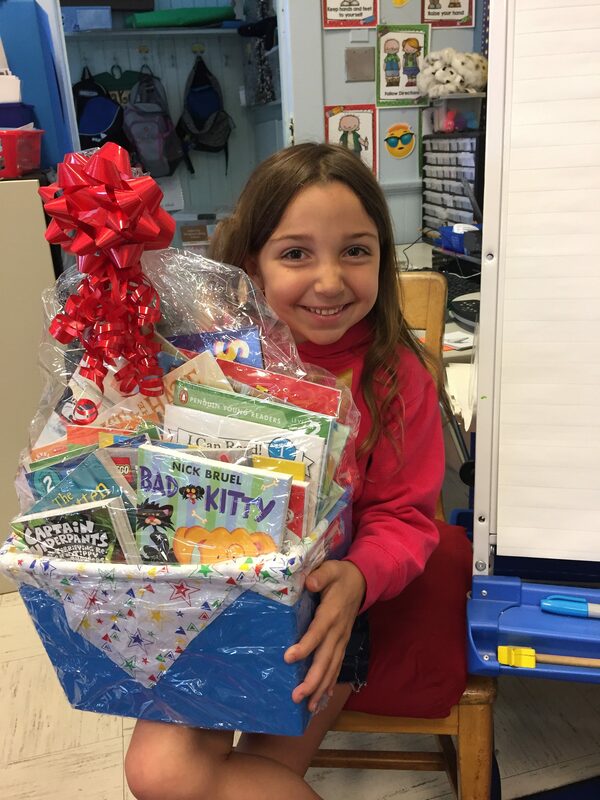 Linnea Madden from Mrs. Mikuski’s class was the lucky winner of our Book Basket Raffle for donating to All for Books at the Book Fair! 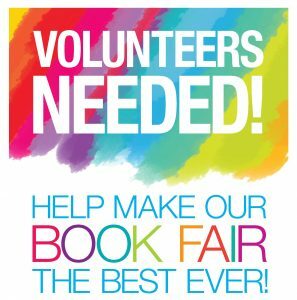 Those donations will be put towards books to be purchased and donated to our wonderful Allenwood library! 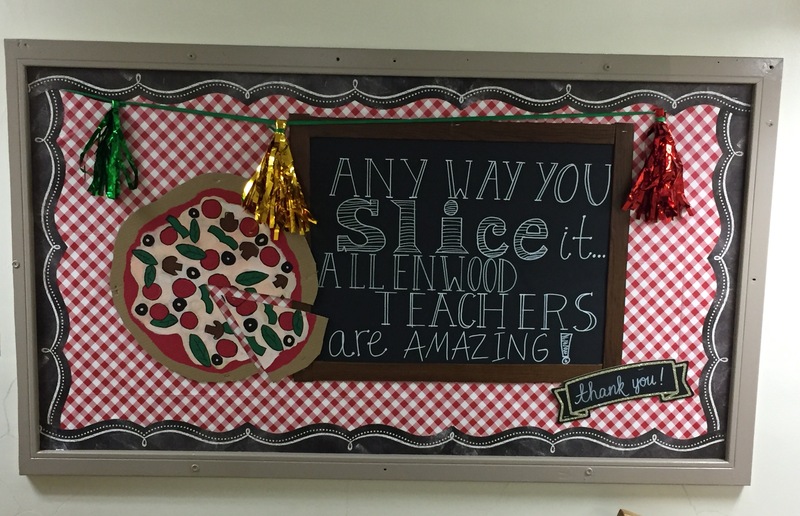 Thanks again for supporting Allenwood and be sure to read your new books over the summer! A DECISION REGARDING THE RAIN DATE WILL BE MADE BY ADMINISTRATION, MRS. SALT & MR. MARITT TOMORROW MORNING. As of NOW, it is ON as scheduled. Every effort is being made to have the event tomorrow. Check the Allenwood District Website, your email for a message from Dr. O’Connell and this page for updates as information will be posted as necessary. See below for more information. 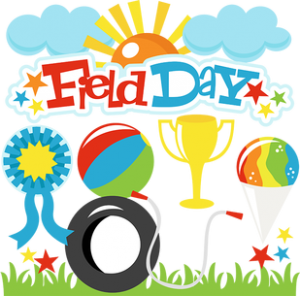 Field Day will be on Friday, 6/1, 9:30 am-11:30 am and 1:15-2:30. Family & friends are invited gather outside on the school grounds to cheer them on. Students should wear sneakers and UNALTERED Field Day shirt! Please bring in a labeled refillable water bottle as the PTG will be providing water and ice pops for the field day participants. If your child is unable to consume the ice pop provided by the PTG, please notify your teacher. 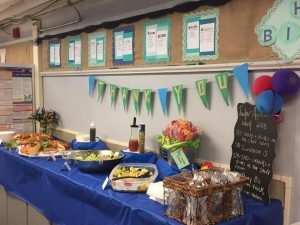 It is time to wish our fabulous 5th Graders FAREWELL! Let them know how much you will miss them and how they’ve inspired others in Allenwood School and the community. 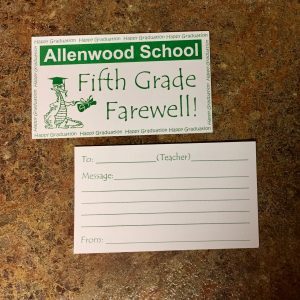 Our FAREWELL cards can be purchased by ANYONE (this is not just for 5th Grade parents/guardians) and are a great way to record shared memories and let them know how great they are! These blank cards will be sent home to you through your child as noted on your email order. Once you receive the blank cards, you will write your messages and the address the card to the appropriate 5th Grader. Please note a last name initial if there are a few students with the same name. 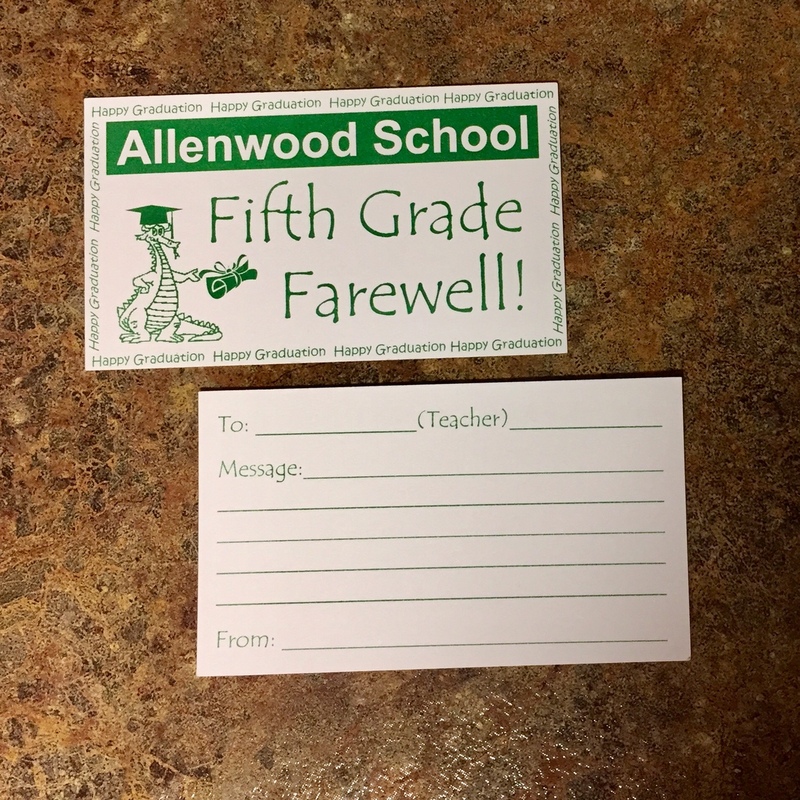 You will then return these cards, along with the appropriate amount of money to school in an envelope addressed to “5th Grade Farewell.” They will be sorted and given to each 5th Grader during the last few days of school. $1 per card. Checks made to Allenwood PTG please. We accepting orders through 6/7 and completed cards by 6/12. Below are some reminders, news and upcoming events to make note of! Students should wear sneakers, UNALTERED Field Day shirt and sunscreen! Please bring in a labeled refillable water bottle as the PTG will be providing water and ice pops for the field day participants. 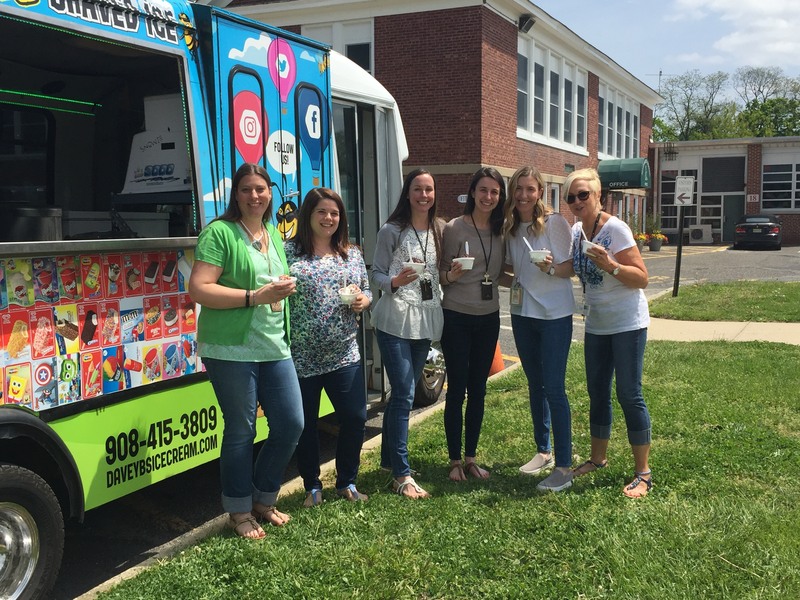 Students will shop during school on Tuesday, 5/29 and Wednesday, 5/30. There are NO preview days, students WILL purchase during school according to schedule below. Family Night Shop is Wednesday, 5/30, 5:30-7:30 pm. 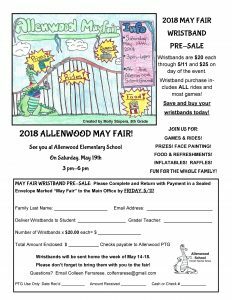 Cash, check made payable to Allenwood PTG and credit cards are accepted. Lots of great books for summer reading. 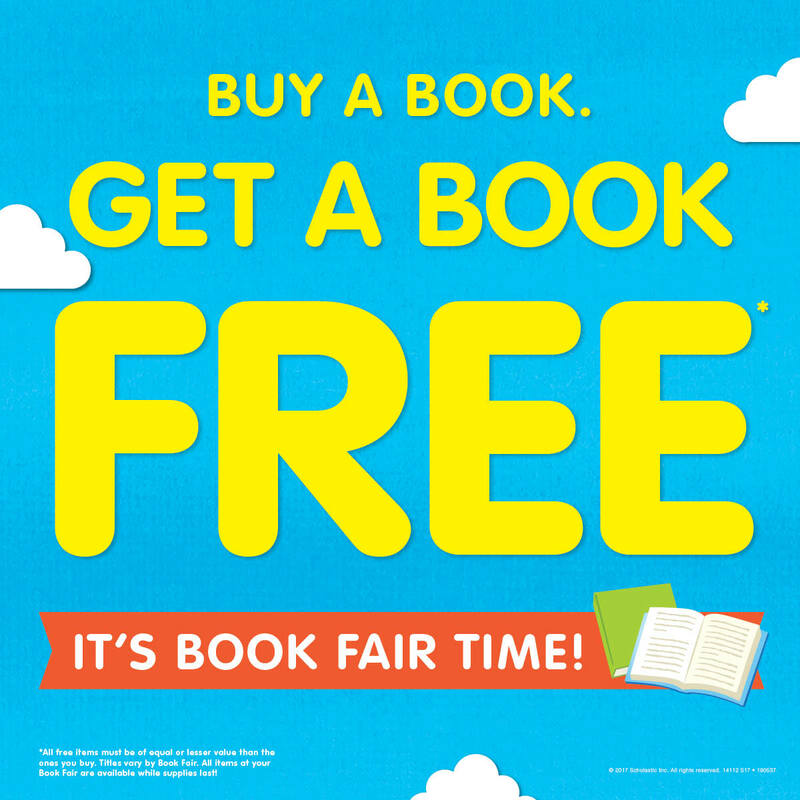 Books for all ages and boxed sets too! 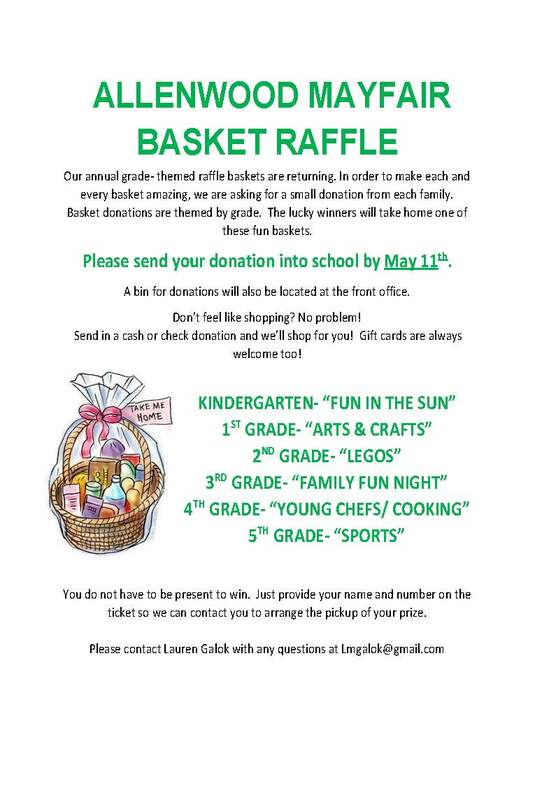 ORDER & DONATION DEADLINE, Tuesday, 5/29! 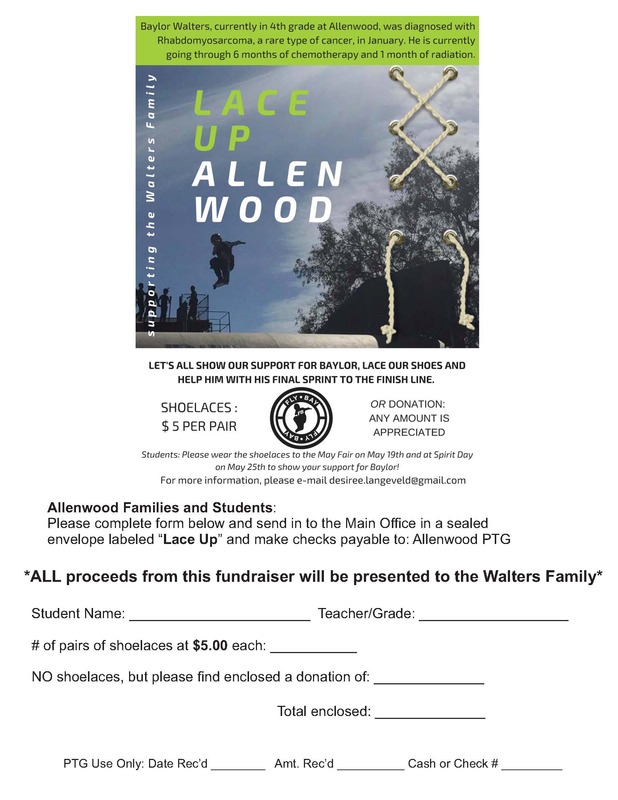 A fundraiser event “Lace Up Allenwood” to raise money for our awesome fellow Allenwood student, Baylor Walters, who has been diagnosed with Rhabdomyosarcoma, a rare type of cancer, and is currently going through 6 months of chemotherapy and 1 month of radiation. To show support for Baylor, we will lace our shoes with green shoelaces and help him with his final sprint to the finish line by wearing them to Field Day, 6/1. Shoelaces can be purchased for $5 per pair by completing the order form below and returning to the Main Office by 5/29. Any donation would be greatly appreciated! All proceeds from this fundraiser will be presented to the Walters Family. The final dining out initiative for this school year will be Monday, June 11th at Just Dough It! Thanks to Andrea Cocco for organizing! 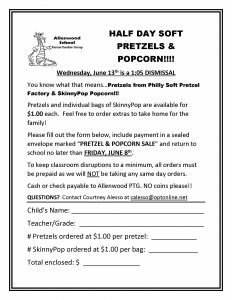 FINAL Pretzel & Popcorn Sale of the Year! 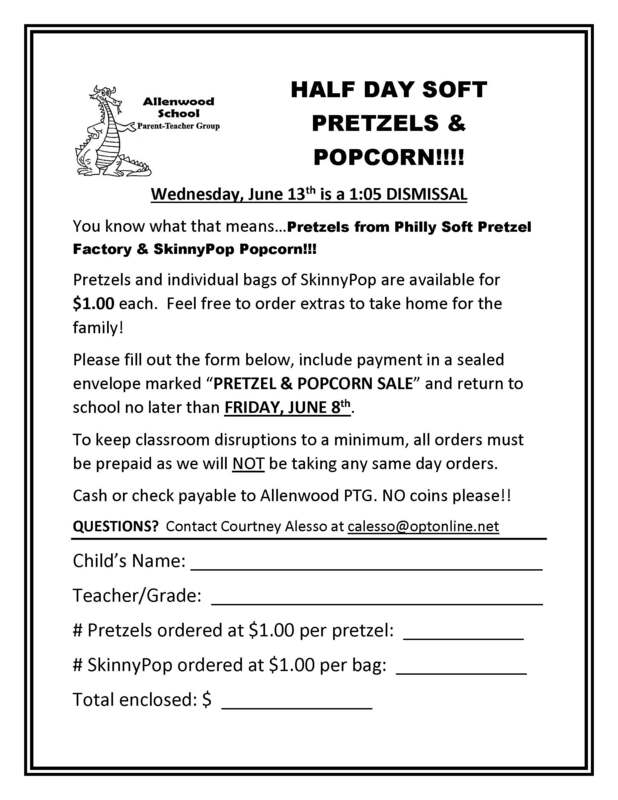 Mark your calendar as Wednesday, June 13th will be ½ day Pretzel & Popcorn Day at Allenwood. Orders due by FRIDAY, 6/8! Thank you to Courtney Alesso for organizing ALL of the Pretzel & Popcorn sales this year! 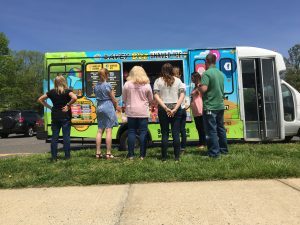 6/11- Dining Out: Just Dough It! Dragon News: Week of 5/21 at Allenwood! 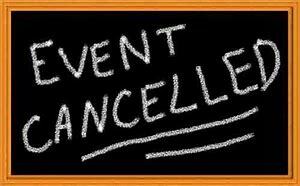 Kindergarten Field Day was rescheduled and will be on Tuesday, 5/22, 9:30 am-11 am. Family & friends are invited gather outside of the Gym (near the playground) to greet the Parade of Champions at 9:30 am and cheer them on. Kindergartners should wear sneakers, Field Day shirt and sunscreen! 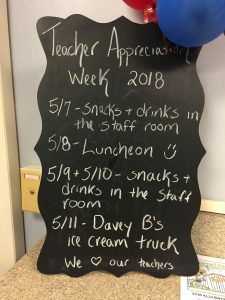 Please bring in a labeled refillable water bottle as the PTG will be providing water and ice pops for the Kindergartners. 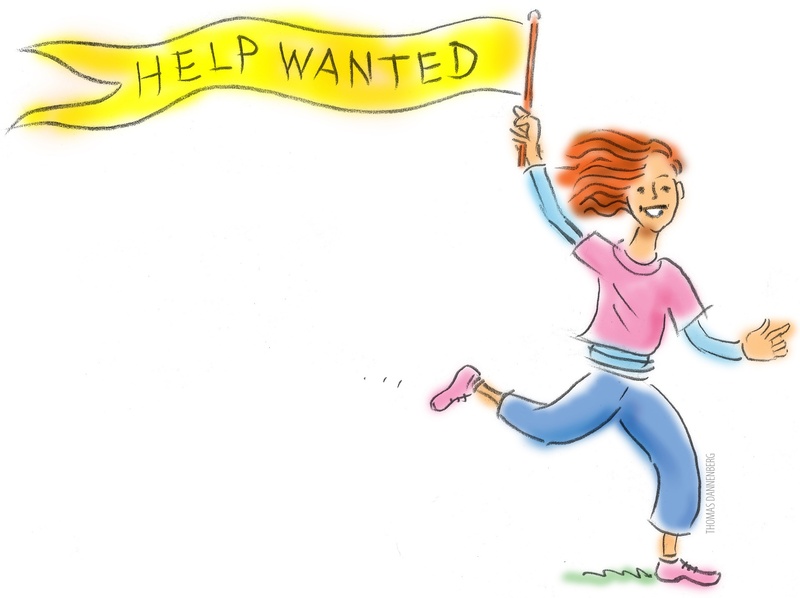 If there are any questions, please contact Kristin Coman at kcoman@awptg.org. Beautify your yard for Spring! 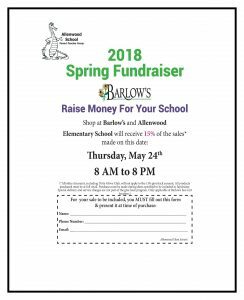 Shop Barlow’s on 5/24 and Barlow’s will donate 15% of sales to Allenwood. May Spirit Day! 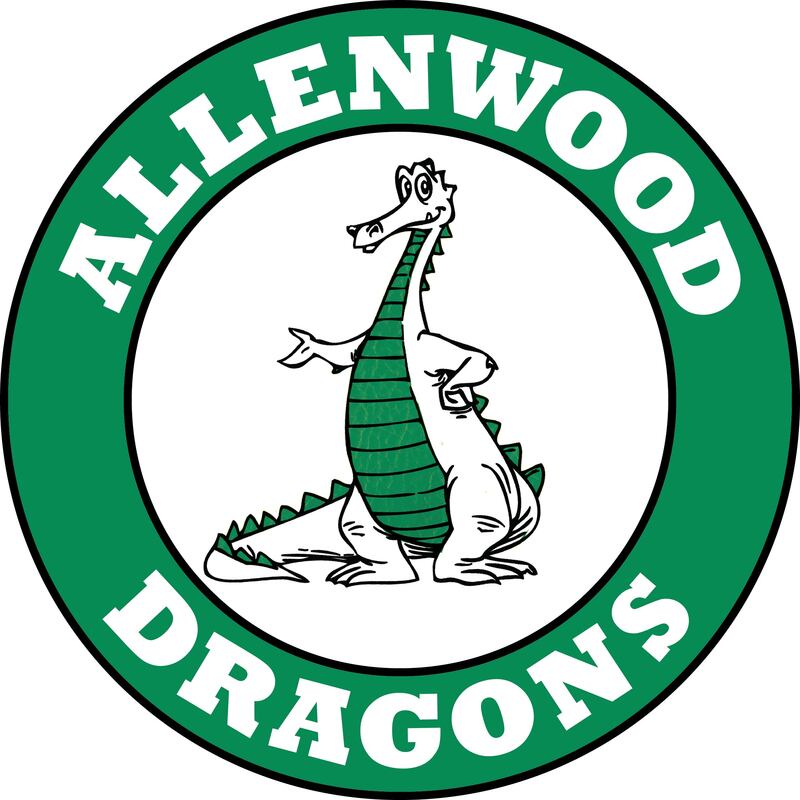 Be sure to wear your Allenwood Spirit Wear or green & white! To show support for Baylor, we will lace our shoes with green shoelaces and help him with his final sprint to the finish line by wearing them to Spirit Day on May 25th. Shoelaces can be purchased for $5 per pair by completing the order form below and returning to the Main Office. Any donation would be greatly appreciated! 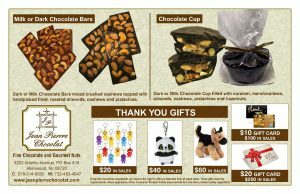 Jean Pierre Chocolate & Nut Fundraiser Update! 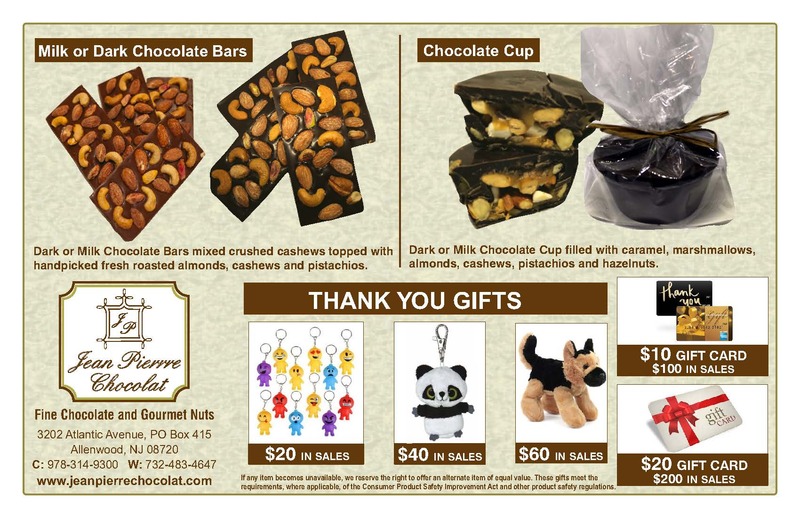 For those that shopped local and ordered those delicious chocolate bars and chocolate cups from the Jean Pierre Chocolate and Nut Fundraiser, you helped raise $221.10 for PTG sponsored events and programs! 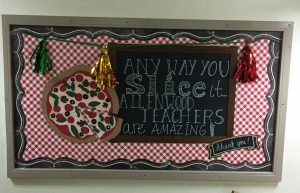 Thank you for supporting Allenwood! Great big thank you to all the families and staff who contributed to the Spring Clothing Drive. 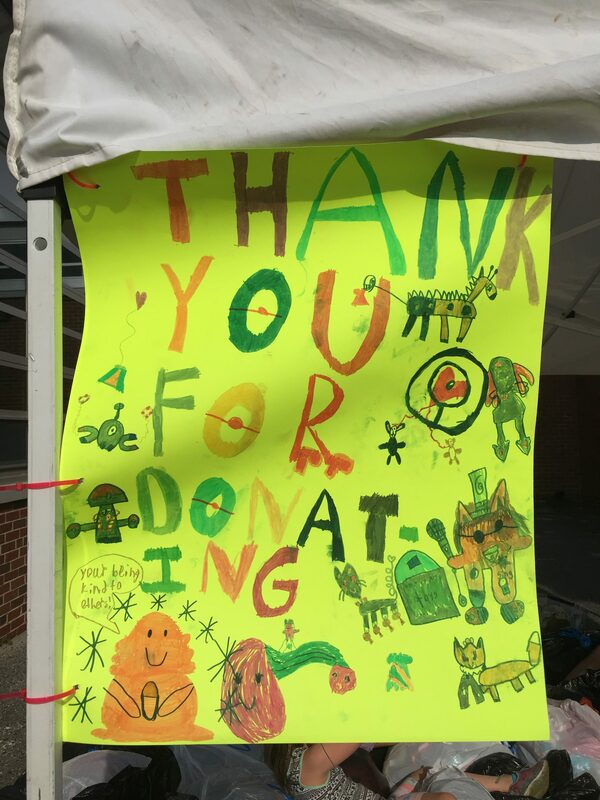 With your help we raised over $250.00 and collected over 1,300 lbs! Thank you to Heather Hunt for continuing to head up our Clothing Drive committee! 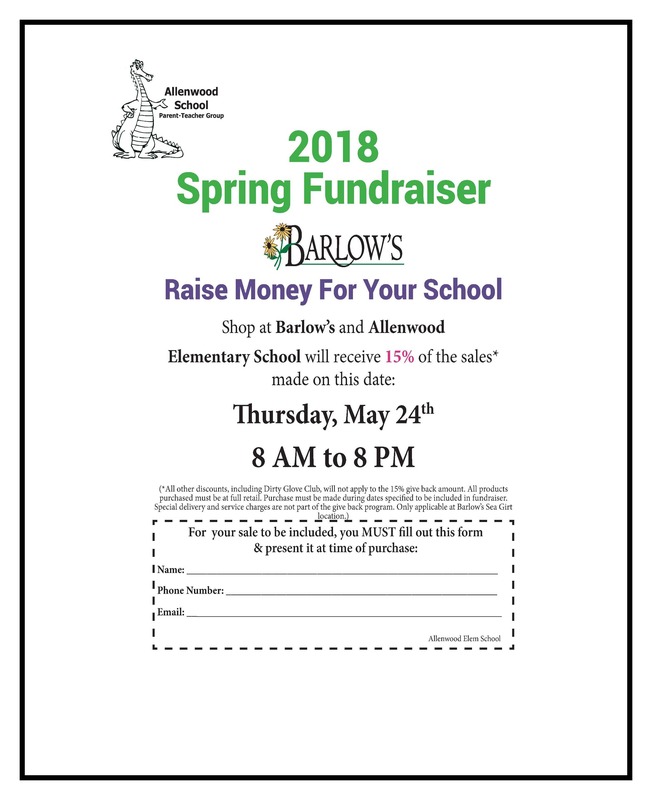 -While students shop during school on 5/29 and 5/30. -Family Night Shop on Wednesday, 5/30, 5:30-7:30 pm. -Breakdown on Thursday, 5/31 at 9 am. Due to the rainy weather all week and continued rainfall expected in the upcoming days, this year’s Allenwood May Fair event for Saturday, May 19th has been cancelled. The safety of our attendees and volunteers always comes first! All pre-sale wristband payments will be returned within 1-2 days with the child indicated on the wristband order form. We sincerely hoped for Mother Nature’s cooperation and apologize for any unhappy dragons this may cause and look forward to greeting you, and your families for a possible fall event. 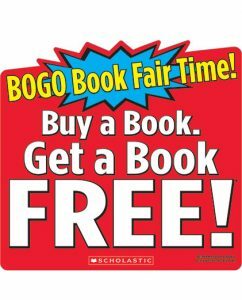 Scholastic BOGO Book Fair is just around the corner! Lots of great books for summer reading. Books for all ages and boxed sets too! Students will shop during school on 5/29 and 5/30. Family Night Shop is Wednesday, 5/30, 5:30-7:30pm. Teacher schedules and volunteer sign up link will be posted soon. NEW DATE for Kindergarten Field Day! It seems that the weather is being quite uncooperative! Looking ahead at the forecast for Friday, we know it is going to be very rainy. Looking further ahead to Monday (the original rain date) it still seems that the conditions are still not good for Field Day. 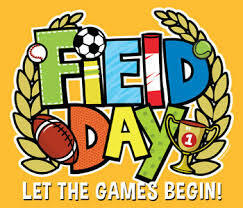 For the safety and enjoyment of our Field Day Athletes, as well as for our cheering fans, we will move our Kindergarten Field Day to TUESDAY, MAY 22nd. Our Parade of Champions will begin at 9:30 am, so we hope to see everyone out back by the Gym on TUESDAY, MAY 22nd! Dragon News: Week of 5/14 at Allenwood! Hope everyone had a great weekend and Happy Mother’s Day! Those that purchased May Fair Wristbands during the pre-sale will be sent home mid-week! Please check through your students backpacks and folders for the envelope. If you do not receive your wristbands by Thursday evening, please notify Colleen Ferrarese, colferrarese@gmail.com. Please remember to bring or wear your wristbands to the event on Saturday! The next dining out initiative is TOMORROW, Monday, May 14th at Buffalo Wild Wings (Brick Location Only) and 15% will be donated to Allenwood! Thank you Andrea Cocco for organizing! Kindergarten Field Day will be on Friday, 5/18 (5/21 rain date), 9:30 am-11 am. Family & friends are invited gather outside of the Gym (near the playground) to greet the Parade of Champions and cheer them on. 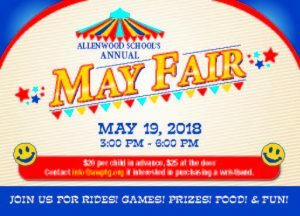 Come out this Saturday and support Allenwood’s 2018 May Fair!! Come enjoy a fun filled day at the fair! meet & greet with Skittles, raffle baskets and much much more. 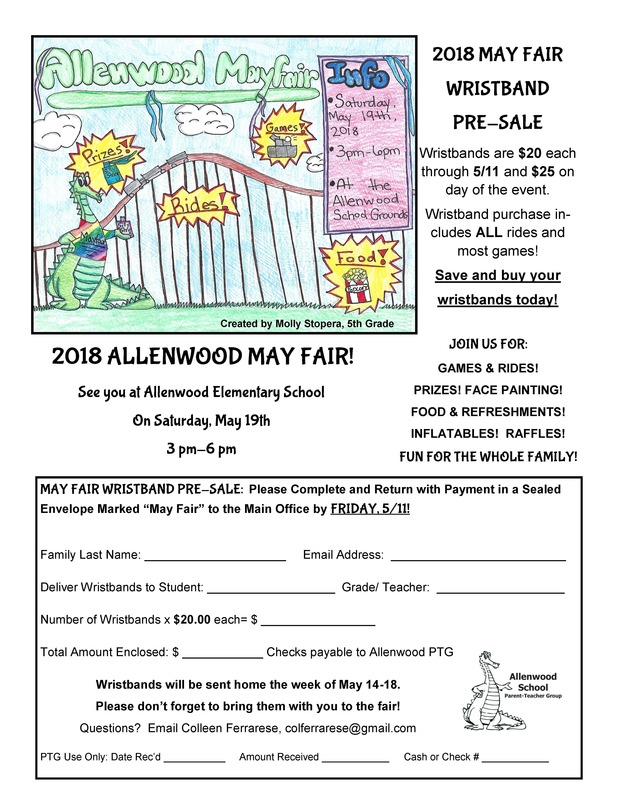 Wristbands can be purchased at the event, $25 for unlimited rides and games! To show support for Baylor, we will lace our shoes with green shoelaces and help him with his final sprint to the finish line by wearing them to May Fair and Spirit Day on May 25th. Shoelaces can be purchased for $5 per pair by completing the order form below and returning to the Main Office. Any donation would be greatly appreciated! 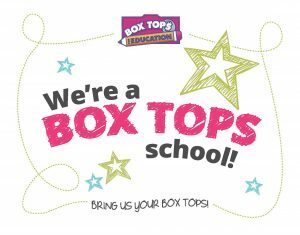 Thank you for all the classes for donating Box Tops. Keep clipping all year long! This year your efforts raised $764.90 for Allenwood! 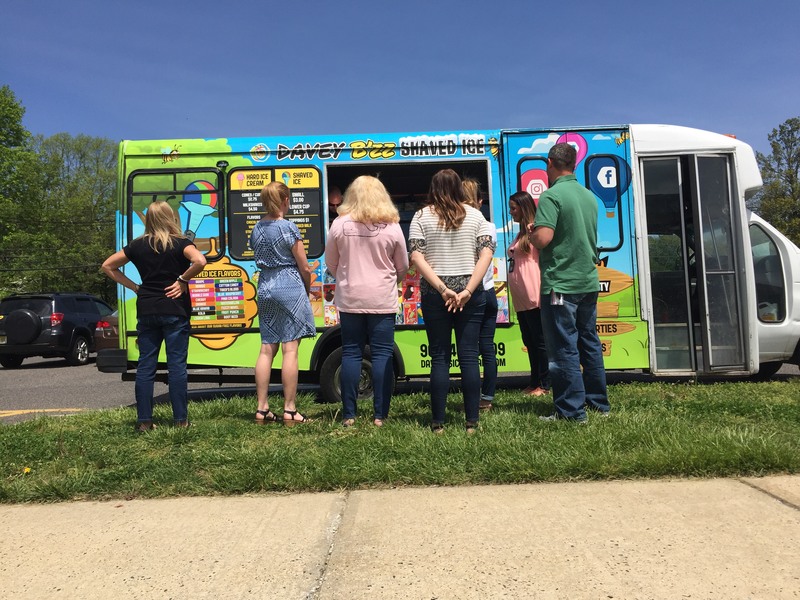 Thank you to Melissa Cullen for organizing our Box Tops for Education program and the Cullen Family for donating the Kona Ice Truck for the Box Top Class Contest winner Mrs. Malick’s Third Grade!! Here’s the scoop, you’re the best! 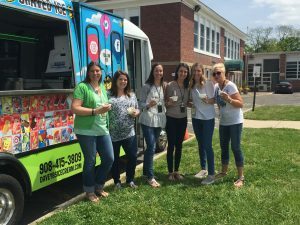 To close out our Teacher Appreciation Week festivities Davey B’s Ice Cream Truck came school to serve shaved ice, ice cream, and packaged novelties to our teachers & staff, compliments of the Allenwood PTG. Though we celebrate you every day, we are especially thankful for this opportunity to show our love & support for all that you do for our children, school & community! 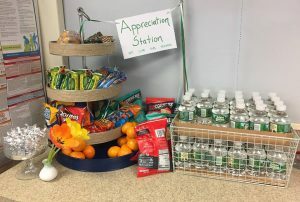 Thank you again to our Teacher Appreciation Chairperson Jess Sarnak and all the PTG volunteers for your time and donations! 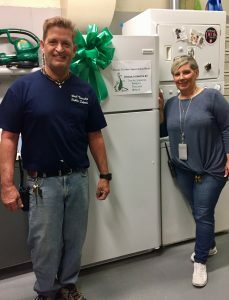 In the spirit of Teacher Appreciation Week, the PTG delivered a replacement of the existing refrigerator currently located in the Custodian Office. It is heavily utilized by many, including the PTG for various events and activities and was not keeping temperature as needed. 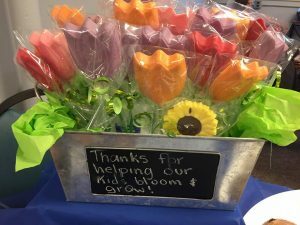 We also learned it was a Wish List item for some time and thought it would be a great token of appreciation from all of us in the PTG! Today our teachers & staff enjoyed a delicious lunch buffet, dessert table and ice cold beverages with items generously donated by our Allenwood parents and PTG. Items were so tasty, many requests were made for recipes! 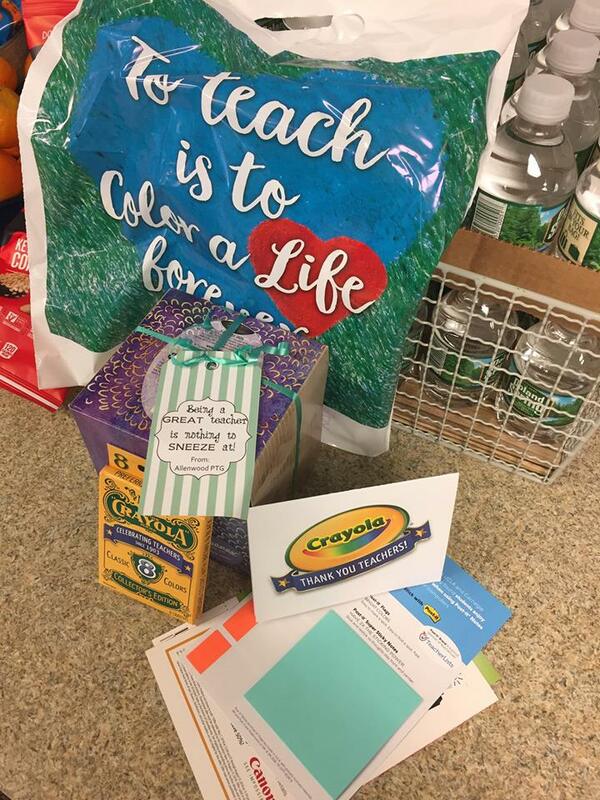 Starting the week off with snacks, beverages, good tissues and goody bags for our teachers! 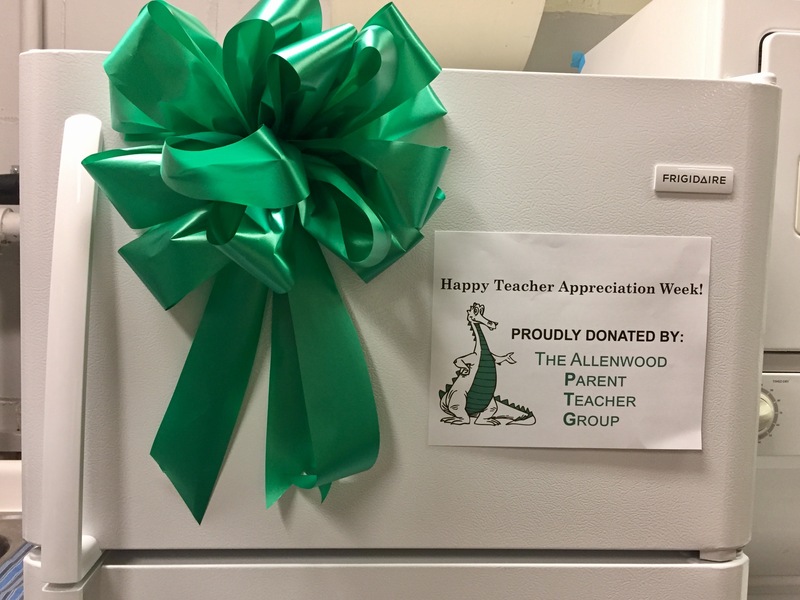 The Allenwood PTG wishes a Happy Teacher Appreciation Week to all of our truly amazing Allenwood Teachers! Thank you for making our school special. 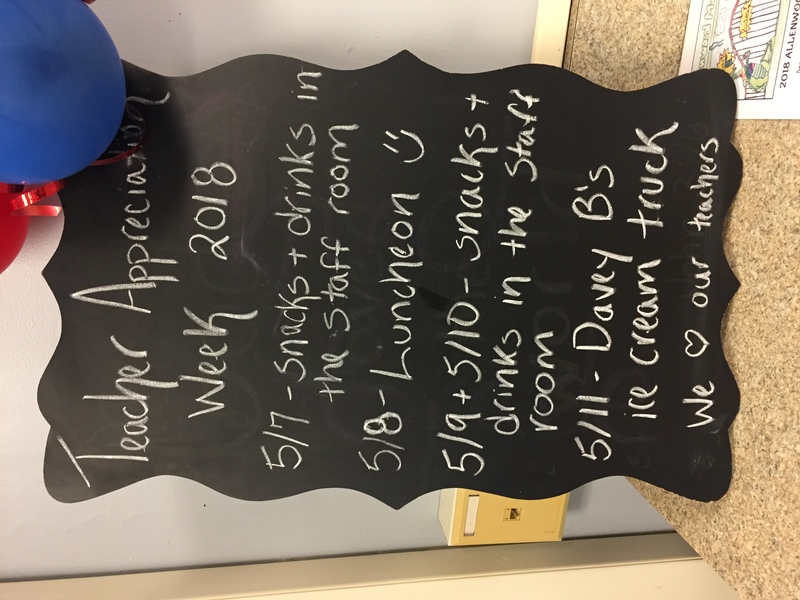 Throughout the week there are surprises and planned events to show our teachers & staff how appreciative we are! 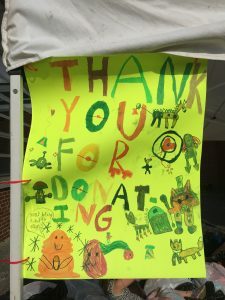 Thank you to Jessica Sarnak for organizing the week and all the wonderful PTG volunteers for their time and donations! 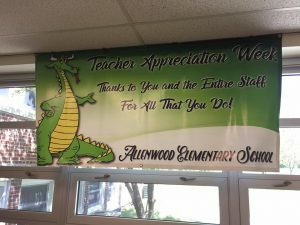 Dragon News: Week of 5/7 at Allenwood! 3rd Place with 1,800 collected items is Mrs. Piermattei’s Kindergarten class. 2nd Place with 2,780 collected items is Mrs. Malick’s 3rd grade class. And in 1st place with 2,994 collected items is Mrs. Shanklin’s 5th grade class! 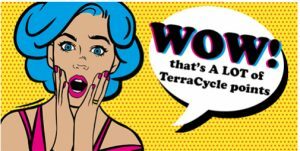 Congratulations to our top 3 classes and thank you to all of our TerraCycle supporters! 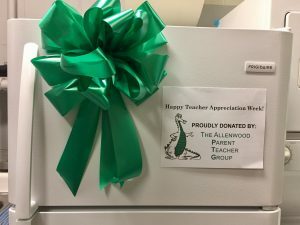 We earn points for shipping qualifying items for each program we participate in and turn our points into a monetary contribution for Allenwood PTG. 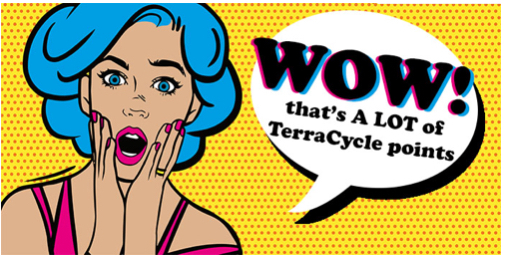 This program has been successful as a result of your help (and snacking)! Thank you Anna White for organizing our TerraCycle program and all of our TerraCycle volunteers for braving all the lunch shifts, especially those involving syrup! Thank you to all that dined in or enjoyed take out from The Coal House on 4/24 and supported our April Dining Out event. The Coal House generously donated 20% of the entire day, not just 20% of the flyer sales for a total of $270.00 towards PTG sponsored events & programs! Our Spring Clothing Drive was a success and a big thank you Heather Hunt for organizing and helping us all have clean closets! 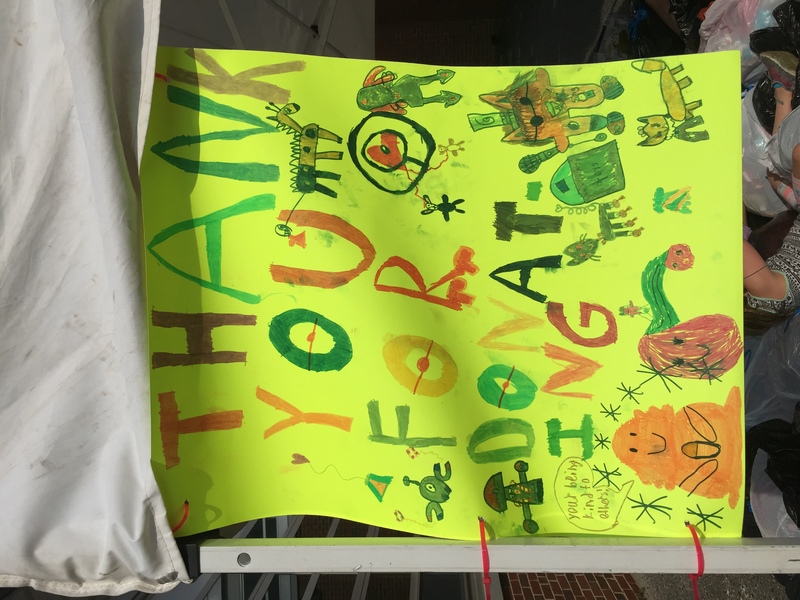 The Hunt Family also created a thank you of their own for those to see when dropping off! Jean Pierre Chocolate & Nut Fundraiser Delivery! 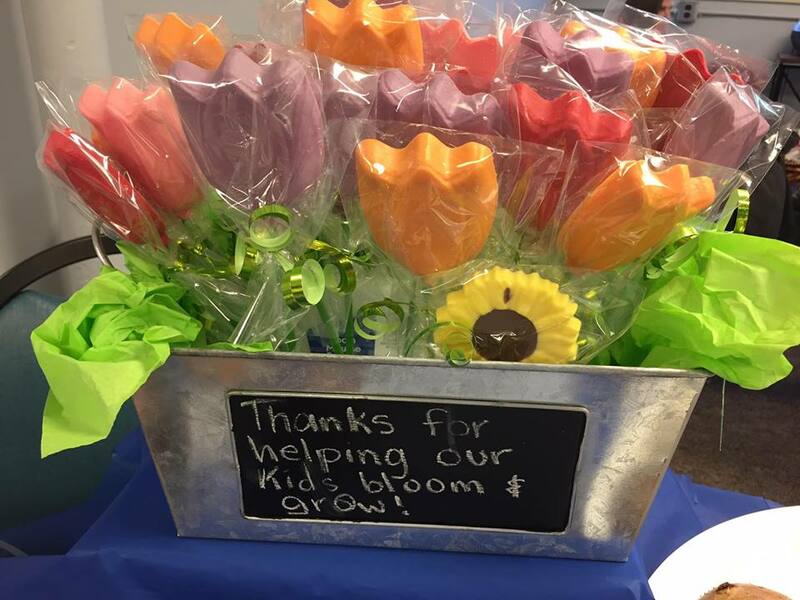 Orders will be delivered to school and coming home with the students on Thursday, 5/10. If you have a larger order or would like to arrange a pick up please contact Kristin Coman at kcoman@awptg.org. May Fair Wristband Pre-Sale Deadline! 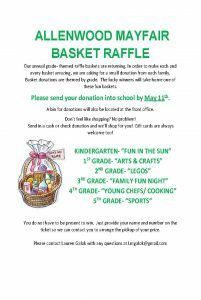 May Fair Raffle Basket Donations Deadline this Friday! The next dining out initiative will be Monday, May 14th at Buffalo Wild Wings (Brick Location Only)! We earn points for shipping qualifying items for each program we participate in and turn our points into a monetary contribution for Allenwood PTG. This program has been successful as a result of your help (and snacking)!